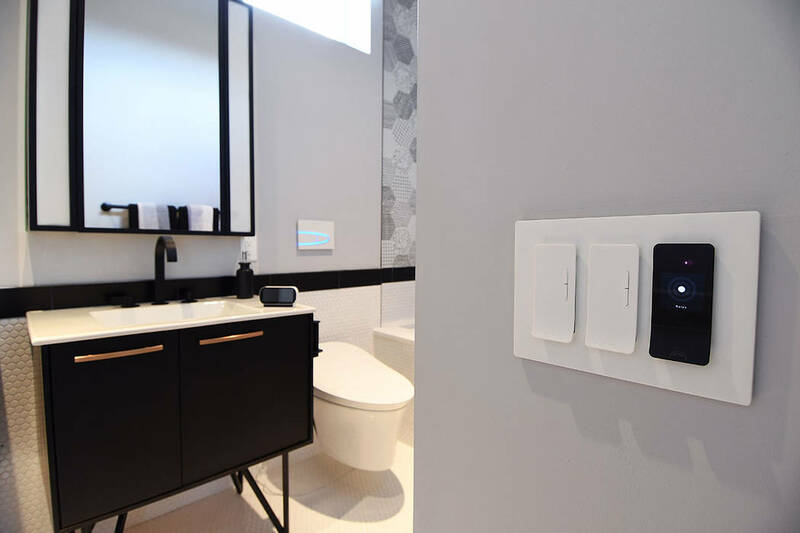 It’s called the KB Home ProjeKt, and it was created with the help of multiple builder partners to showcase smart-home technologies that are available in the marketplace. 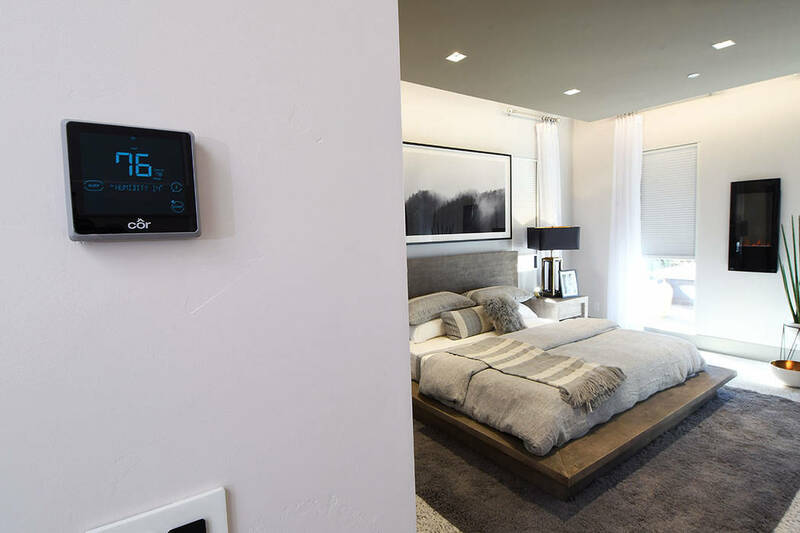 “A lot of our new KB homeowners are expecting more and more as far as smart-home features go,” said Brian Kunec, regional manager of KB Home Las Vegas and Seattle. 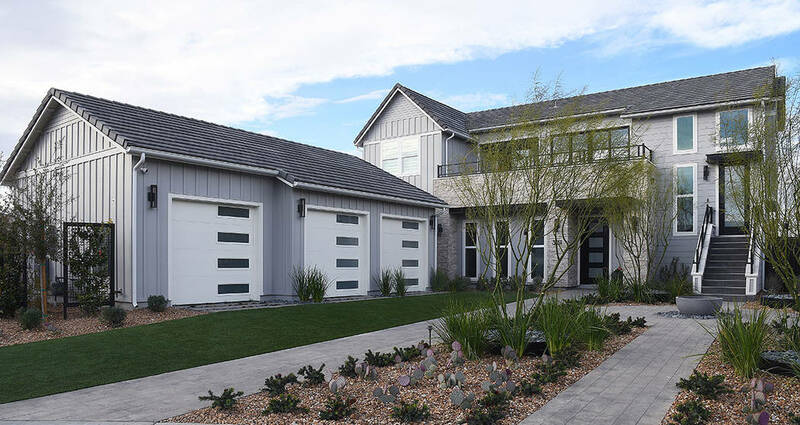 A Nest Hello Video doorbell at the front door is the first indicator of a technology gateway to this two-story home, which occupies 3,200 square feet of living space within three bedrooms and has a multipurpose flex-room and two baths. The doorbell has an integrated video camera with facial recognition capabilities that can match the face at the front door with the names of familiar visitors. Unknown visitors can be monitored on an internal display and greeted by the homeowner’s voice remotely through a mobile phone app, even when no one is occupying the residence. The Google Home ecosystem connects and integrates the smart technologies of the KB Home ProjeKt through a mesh Wi-Fi network into a programmable environment that can be accessed by residents through touch-screen devices or voice interaction with Google Assistant. 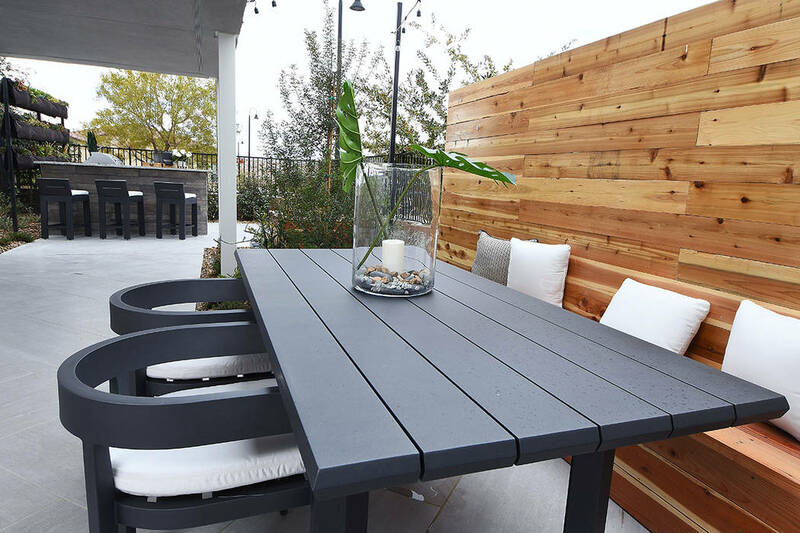 Technology partners featured in the showcase home include Builder magazine, DISH Home Services, Delos, Nest, Kohler, Carrier, Whirlpool, Hunter Douglas, Western Window Systems, Kwikset, Schneider Electric, Phyn, Vinotemp and Rain Bird. The entrance hallway to the home leads past a stairway that ascends to the second floor, as the hallway continues into the living room and kitchen area. The living space is framed by glass pocket doors that reveal a backyard patio with spa, water and fire features and a lounge area. A voice command like “Hey Google! I’m home” can be recognized by Google Assistant as a program cue to adjust the lighting in the room, raise or lower the motorized shades in front of the glass pocket doors to the patio, manage the room temperature of the Carrier HVAC system, turn on water and fire features, while playing ambient soothing music to help a resident unwind after a busy day of work. A Vinotemp wine refrigerator and dispenser with transparent glass doors allows visitors to serve themselves from an assortment of vintages, each chilled to its appropriate temperature. Smart Whirlpool kitchen appliances allow a resident to scan a bar code on a food package from a cellphone app. The bar code information is translated by Google Home into a choreographed sequence of actions that can turn on the oven to the appropriate cooking temperature, then monitor and turn the oven appliance off after the suggested cooking time. A Kohler smart faucet on the kitchen island sink can respond to a voice command to Google Assistant and dispense the exact cups of water needed for a coffee maker. A “grow wall” next to the kitchen pantry holds a vertical garden mounted with four rows of planter boxes seeded with herbs and other fresh greens that can be picked and used immediately while cooking. The spacious living room and kitchen area can become even larger thanks to a bit of James Bond movie magic. A flexible, motorized wall next to the front stairwell contains a wet bar but has been built onto four tracks along the floor and ceiling. The whole wall with wet bar can slide backwards all the way up against the opposite inner wall when activated by a panel switch. Pocket doors on either side of the motorized wall can be slid open to configure the “flex-room” into a variety of sizes and shapes. A retractable Murphy bed embedded within the internal wall can be pulled out and down to convert a den space into a sleeping area. The KB Home ProjeKt was built with a nod to the “shared economy” applications, so that both the “flex-room” downstairs and the top-floor suite can be partitioned as separate and private living spaces. The top-floor suite includes a bedroom, bath, living room, kitchen and outdoor patio with its own separate stairway entrance from outside the home. The internal stairway near the front-door entrance of the home can be secured and partitioned apart from the downstairs living space with a sliding door. The KB Home ProjeKt has partnered with Delos to showcase its Darwin Home Wellness Intelligence platform. Darwin algorithms are integrated within the Google Home ecosystem to continuously maintain a healthy living space by subtly adjusting lighting, room temperature, air quality, water usage and background. The Darwin circadian lighting system couples programmable LEDs with motorized window shades to mimic the light patterns of the sun outside the home to better harmonize each resident’s body senses to the time changes of the natural world. Darwin sensors continuously monitor the ambient air inside the home for allergens and CO2 levels in each separate room. These sensors can trigger active filtering systems to clean the air in each room as needed. Combinations of mood-enhancing lighting, room temperature adjustments and ambient music dynamics can be activated by a resident’s voice to help increase productivity or enliven a party. Kohler smart-plumbing fixtures can turn a shared bath into a customized “his or her” spa experience. A smart shower can be programmed to the favorite water temperature and flow intensity, and dedicated personal mirrors can be programmed with lighting preferences and ambient music dynamics for each user. A Kohler smart toilet in each of the two baths can recognize the presence of movement and automatically “pop its top” to allow access and raise the toilet seat up or down. Temperature adjustment, lighting and background music are available on demand within the space. Motion detectors can sense when someone is moving from bed to bath at night and turn on a low-level night light to guide the person to the toilet area without waking other occupants of the home. The walk-in closet area includes a laundry basket and rear-door hatch that opens through the back end of the closet into the laundry room next door. 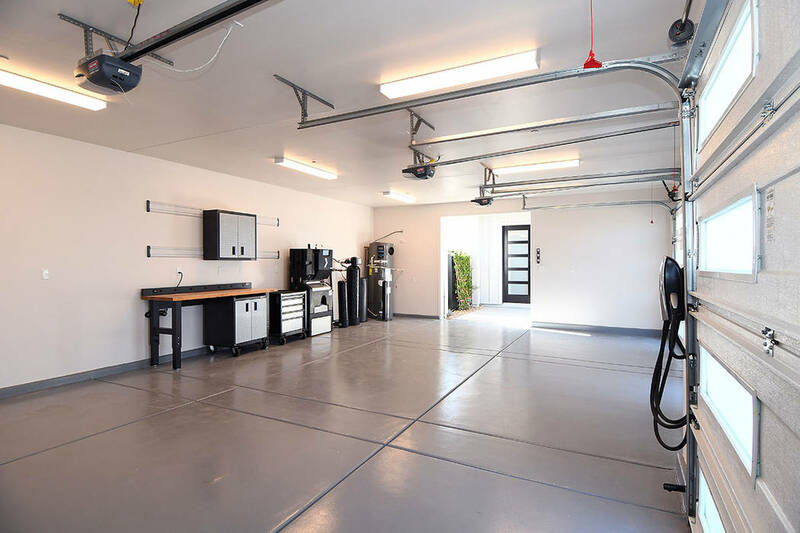 Within the three-car garage, a programmable water heater and Phyn water flow module can monitor temperature in the pipes of the home and detect leaks and issue an alarm notification to a homeowner. A gray-water filtering and collection system is in the garage of the home to allow residents to recapture and reuse water that would flow out of the home to the sewage pipes. A Rain Bird smart irrigation system can be programmed to provide just enough water to the surrounding landscape as needed and can delay water usage when it is raining outside. The KB Home ProjeKt team also worked with Tesla Inc. to harness energy from the sun through photovoltaic solar panels that are mounted on the south-facing rooftop. Excess electricity generated by the 8-kilowatt system that is not immediately used by the home can be stored within two Powerwall 2 battery systems. Over 26 kilowatt-hours of stored electrical energy can provide power to appliances at night or when the sun isn’t shining. A Tesla High-Power charging station is available inside the garage to charge a Tesla electric car from energy provided by the sun. The top floor of the KB ProjeKt home includes a full suite with bedroom, bath, living room, kitchen and patio. The suite is accessible through glass pocket doors to extend the indoor living space outside. Multiple windows allow the kitchen and living room space to be well-lit during the day by natural light, whose intensity can be controlled by Hunter Douglas motorized shades. The shades automatically open and close and retract upward through touch control of a digital wand attached magnetically to a connector. 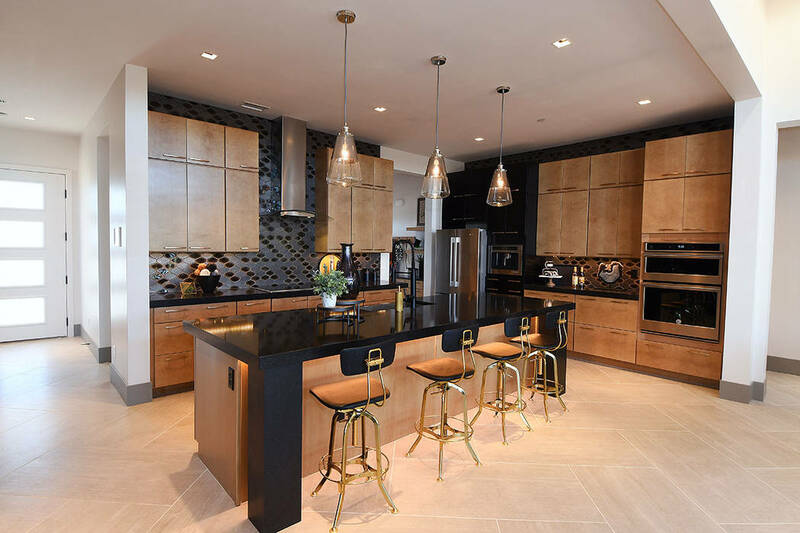 The kitchen area includes an island preparation area that has two pull-out, extendable wood dining table partitions. When the homeowner leaves for work in the morning, a voice command like “Hey Google! I’m leaving” can shut off music and lighting, lower window shades, adjust room temperature to save energy and activate the home security system. 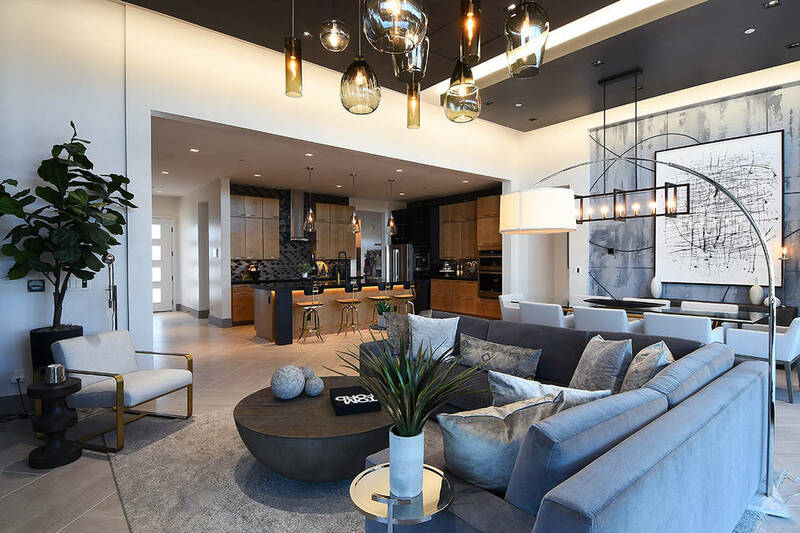 The KB Home ProjeKt will be exhibited during January and February and will be showcased at the NAHB International Builders Show from Feb. 19-21. After that, the KB Home ProjeKt model will be listed for sale. It is estimated to start in the high $900,000s. For more information, visit www.builderonline.com/kbhomeprojekt.